While the 4th of July technically marks the anniversary that America declared independence from the Kingdom of Great Britain, I like to reflect on our country’s founding principles instead. In other words, remind myself that anything that inhibits our ability to achieve our dreams is an obstacle that is subject to removal. I also like to think that by approaching Independence Day from this perspective, it makes it more inclusive our friends in the rest of the world, and not about some old argument with an enemy long forgotten. It seems that we often look for external sources of oppression, but sadly we can exert little effect on these as individuals. Luckily, if we look a bit deeper into ourselves, we find that our personal choices are also playing a role in the level of freedom we each feel, and with enough willpower we increase the number of positive choices we make. For example, the acceptance of debt and living beyond our means is a personal choice we make to obtain things we could not otherwise acquire. The result of this choice is a life lived on the margin of debt, which usually feels just fine as long as the margin is wide. But when times are hard the margin narrows, or even moves into the negative, we find ourselves insolvent and stuck in things like homes whose mortgages exceed their value. I mention this one particular example because debt also seems to be the current cancer infecting our world and impeding freedom. 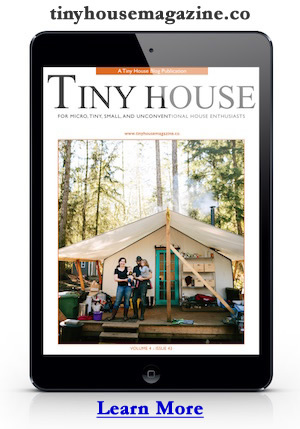 Tiny houses represent a simpler and more sustainable debt-free life. For the past several years I’ve been using the vision of tiny houses as an icon of freedom to help me imagine, and facilitate, a way to increasing my own personal freedom. I’ve found that tiny houses are especially useful for retraining myself to value a better life through downsizing, over a life of borrowed artificial riches. Every day the values they represent help me move in the right direction. Just food for thought, and I don’t want to put a downer on your day. But I hope it helps point out a seed that has already has been planted. Nurture it and give it space to grow and we might together realize another revolution of sorts. This entry was posted in Tiny Living and tagged 2010, 4th of july, debt-free, freedom, Independence Day. 330 sq. ft. is small? I wish I had that much space. Great idea/concept though. Still I’m not sure that if I had this kind of money I wouldn’t just move. This had to cost him a fortune.